The 50 foot long fishing vessel Neptune went aground near Raspberry Island, Alaska. The Neptune’s suffered water ingress from a eight inch hole in the hull. The Coast Guard dispatched a helicopter to the scene. The helicopter delivered a dewatering pump and stood by as the Neptune crew made repairs. The crew was able to dewater the vessel and was refloated on the next high tide. The Neptune was taken under tow by the fishing vessel Tempest. As the vessels proceeded to Kodiak, Alaska, the dewatering pump began to fail. The Coast Guard helicopter lowered a second pump which was able to control the flooding to allow the vessels to safely arrive at Kodiak. No reports of injuries. 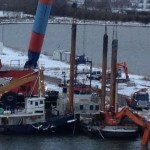 The 25 meter long dredger Jette Saj capsized and sank off the Odense Steel Shipyard near Lindø, Denmark. 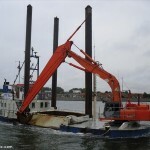 The dredger was offloading sludge when it lost stability and capsized. The master of the vessel easily escaped, but the excavator operator became trapped. He was forced to break a window and swim to the surface. No reports of injuries. 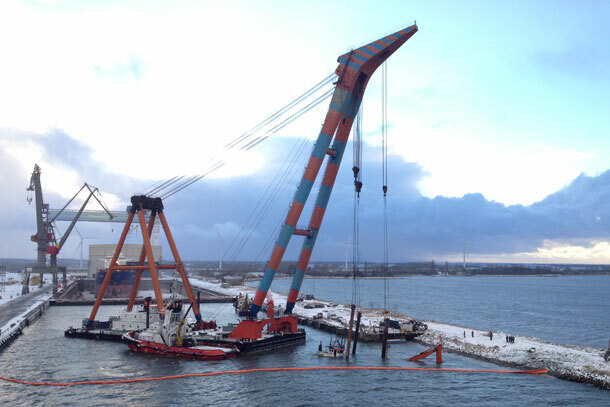 The Jette Saj was refloated the next day by the floating crane Samson.